Our product range includes a wide range of temperature thermocouples sensors, thermocouple sensors and industrial thermocouple. Temperature ThermocouplesSensors are best suited to high temperature, environmental extremes, or applications requiring microscopic size sensors. They are also recommended for high vibration environments. Sensors generating varying voltage signals are thermocouples. They combine dissimilar metallic elements or alloys to produce a voltage. Using specific combinations of metals and alloys in the thermocouple’s legs produces a predictable change in voltage based on a change in temperature. Frequently you will have a choice of thermocouple types. Make your selection carefully, based on factors such as operating temperature, accuracy and EMF output required, and the atmosphere in which you plan to install the thermocouple. Type k- Thermocouple usually works in most applications since they are Nickel based and have good corrosion resistance. It is the most common sensor calibration type providing the widest operating temperature up to 1260 oC. It’s a good practice to protect this type of TC with a suitable metal sheathing or ceramic protecting tube, especially in reducing atmospheres .in oxidizing atmosphere such as electric furnaces, type K will generally outlast Type J because the Jp(iron) will rapidly oxidizes, especially at higher temperatures. Un-exposed, where there is a deficiency of free oxygen, for longer life & clines protective sheathing is recommended. Since JP (iron) wire will oxidize rapidly at temperatures over 540 oC, it is recommended larger gauge wires be used to compensate. Other TC types include: Type B, Type R, Type S, and Type T.
Matrusree Thermocouple Sensors assemblies are an excellent choice for demanding temperature monitoring and control applications. These sensors provide superior construction features for use in a variety of application environments constructions include a wide selection of industry standard probe configurations and mounting fittings. Matrusree offers one of the most complete quality engineered and manufactured thermocouple and rtd selections in the industry, along with a wide array of related sensor accessories such as metal sheathed mineral insulated thermocouple cable, thermowells, jack panels and insulated thermocouple and extension wires. Available from stock or custom engineered/manufactured. Thermocouple sensor consists of two dissimilar metals joined together at sensing point to generate a small thermoelectric voltage when subjected to heat. This change in thermo electric voltage is detected by a supporting instrumentation and acted upon by additional control circuitry. Several type of dissimilar metals are used depending on the application temperature and environment. An infinite variety of combinations can be designed to suit all temperature sensing applications. Type j is the most commonly requested thermocouple wire, followed by type k.
Both are readily available, and other types are available by special request. The two main specialties of Industrial Thermocouple are rugged construction and versatility, with many selections for various temperature ranges. 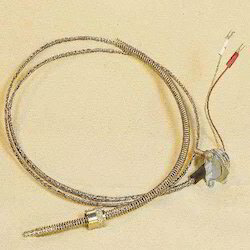 Thermocouples are made up of two different material wires welded together. These produce a very small DC voltage, depending on temperature and thermocouple type. The controller checks this voltage, and compares it with standard values and, displays controlled temperature. It is inexpensive and comes in a wide variety. 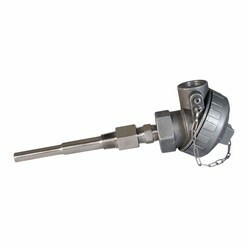 The provided thermocouple can be purchased from us at a nominal price. Looking for Thermocouples Sensors ?